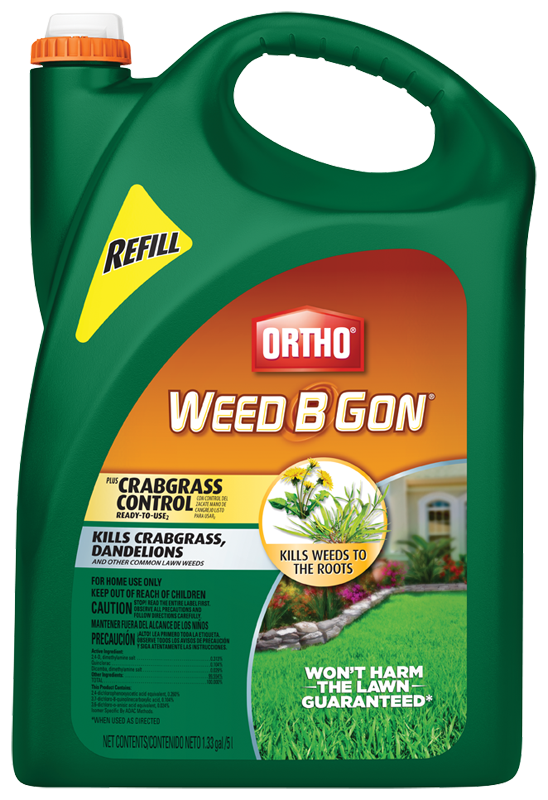 Ortho® Weed B Gon® plus Crabgrass Control Ready-To-Use2 is guaranteed to kill crabgrass, dandelions and other listed common lawn weeds to the root! With the convenient Comfort Wand ® Applicator, you can kill 200+ weeds without damaging your lawn* for easy and effective spot treatment. And Ortho® Weed B Gon® starts working immediately - you'll see results in hours! This product is a Ready-to-Use product intended for the treatment of individual weeds, patches of weeds or sparse weeds scattered through home lawns. Use Ortho® Weed B Gon Plus Crabgrass Control to kill the toughest weeds in these lawns: Bermudagrass, Buffalograss, Fescues, Kentucky Bluegrass, Perennial Ryegrass, and Zoysiagrass. Adjust nozzle. Aim at center of the weed, and spray to lightly cover. Do not use on St. Augustinegrass (including Floratam), Centipedegrass, Bahiagrass, Bentgrass, Carpetgrass, Seashore paspalum. Do not use on lawns with desirable clovers or legumes, Dichondra, ornamental plants, or gardens including vegetables, fruit trees, vines, and berries. Spray when weeds are actively growing. Rain or watering 1 hour after application will not wash away effectiveness. Spray when daytime temperatures are above 45°ree;F and below 90&degreeF. Apply when weeds are seen and actively growing. Apply when weeds are seen and actively growing. Kills common and tough weeds, including: Barnyardgrass, Broadleaf Signalgrass, Bur Clover, Carpetweeds, Chickweeds, Creeping Charlie, Cudweed, Curly Dock, Dandelion, English Daisy, False Dandelion, Field Bindweed, Filaree, Florida Pusley, Heartleaf Drymary, Henbit, Junglerice, Kikuyugrass*, Large Crabgrass, Oxalis, Pennywort, Plantains, Purslane, Red Sorrel, Sheep Sorrel, Smooth Crabgrass, Giant Foxtail, Green Foxtail, Yellow Foxtail, Torpedograss*, Speedwell, Spurges, Spurweed, Thistles, Toadflax, White Clover, Wild Carrot, Wild Geranium, Wild Onion, and other broadleaf weeds. *Make 2 sequential applications at 14 to 21 day intervals to control. The Ortho® Guarantee: If for any reason you, the consumer, are not satisfied with this product, mail us your original proof of purchase to obtain a full refund of your purchase price. For more help, visit our Help Center. Kills crabgrass and other weeds in your lawn. Ortho's most powerful lawn weed killer!